You'll need to create a LinkedIn login in order to start using LinkedIn, the world's largest network of professionals, almost half of whom are decision makers. You can use your LinkedIn network to find jobs, promote yourself or your business and much more. In order to get started with LinkedIn, you'll need to create an account. Once your account is set up, you can then start adding others to your network and building a powerful tool you can use for your benefit. Here are step-by-step instructions for creating a LinkedIn login. Open your Web browser and go to LinkedIn.com. Type your First Name in the First Name box. Type your Last Name in the Last Name box. Type a valid email address where you receive email. Select a Password for your account. The password needs to be at least six letters. It's a good idea to use both lowercase and capital letters along with at least one number or special character (*, !, etc.) to create a strong password. Don't leave any blank spaces. Click Join Now. This will move you to the next LinkedIn screen. You're ready to proceed to the next step in creating a LinkedIn login. The next step in creating a LinkedIn login is to provide your employment status and location information. Select your current work status. Selections are: Employed, A business owner, Looking for work, Working independently or A student. Your selection determines the fields you see next. If you selected Employed the remaining fields you'll need to complete will be Company, Job Title, Country and Zip Code where you live. If you select A business owner you'll be asked for the name of your business (Company Name), the Industry to which your business belongs, Country and Zip Code where you live. If you selected Looking for work or Working independently, you'll be asked to provide the Industry in which you're seeking work (or currently working), Country and Zip Code where you live. If you're not sure or looking for work in multiple industries, just select one and clarify what you're looking for by going back and editing your profile once your membership is established. If you select A student you'll be asked to provide information on the name of your College/University (when you begin typing, you'll see a list of schools that matched what you typed. You can either select one or finish typing), the dates you attended (starting and expected year of graduation - you must make a selection), your Field of Interest (you must make a selection so choose the closest fit), Country and Zip Code where you live. In all cases, your zip code is kept private, but your region is displayed. LinkedIn will not ask you for your street address unless you order a premium account after you've established your login. Re-check your selections. When you are ready, click Continue to go to the next step in the process of setting up a LinkedIn login. 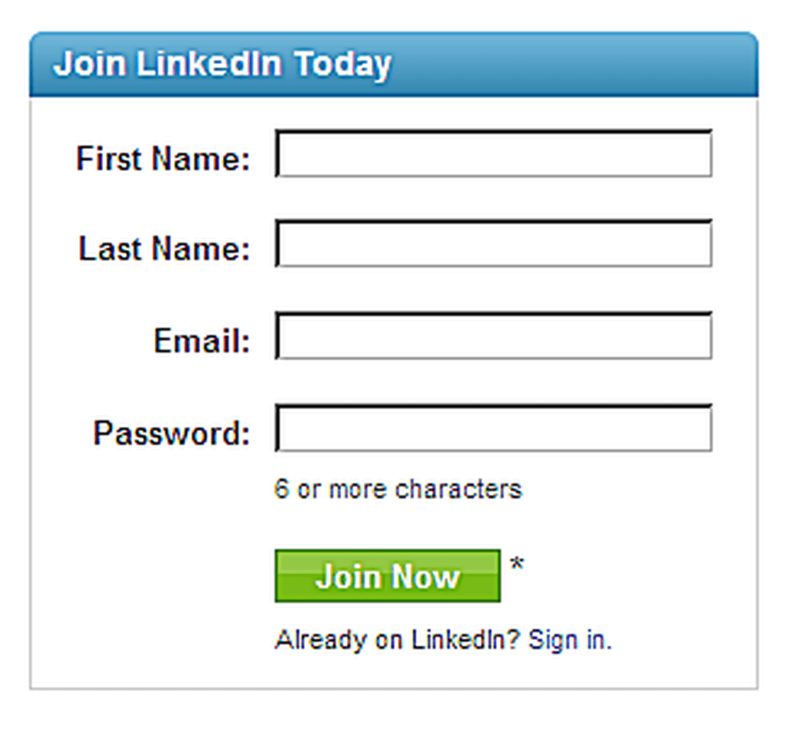 The next step in creating a LinkedIn login is optional. You can start building your LinkedIn network by importing contacts from your email address book. In order to start building contacts, you have the option to import email addresses during the LinkedIn login setup process. If you choose to take this optional step, LinkedIn will check to see if any of the email addresses in your address book belong to existing LinkedIn members. If they do, you'll have the option of inviting them to join your LinkedIn network. Doing this can give you a head start, but it's not required. After you've finished providing your employment status and location information from the previous step in creating your login, the See Who You Already Know on LinkedIn window displays. If you chose Other a selection list becomes available in which you can select from many other email services for your contacts. In all cases, you'll need to log in to your email account so LinkedIn can fetch your stored email addresses from your address book. This step is optional. If you don't want to use this feature, click the Skip this step link near the bottom of the screen. Just because LinkedIn isn't able to match up a LinkedIn account with an email address in your address book, doesn't mean that person isn't on LinkedIn. It's possible that they signed up with a different email account. Once you've either gone through the email address or skipped over it, a confirmation screen displays to let you know that a confirmation email has been sent to the email account you just registered with LinkedIn. If LinkedIn recognized your email provider, a button will be available that you can click to go directly to your (Webmail) email provider, where you can log in and receive the confirmation message sent by LinkedIn. Click the link in LinkedIn's confirmation message. Log in to LinkedIn with the login you just created.